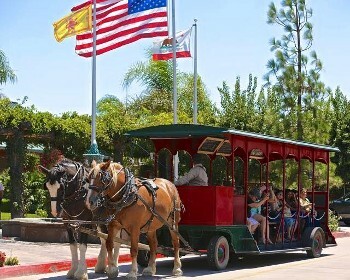 Take your time and travel in style when you step on board the classic Horse Drawn Trolley of Wine Country Temecula. Sit back and let the world pass you by as our good tempered draft horses pull you along at a relaxing old time pace. Trolley shuttles between South Coast Winery Resort and Spa, Ponte Winery, Lorimar Winery and Weins Family Cellars. Each stop is just about 1 hour. Enjoy fine dining, beautiful gift shops, relax in the gardens and of course, wine tasting. Horse Drawn Trolley is available Friday, Saturday and Sunday departing at 10 a.m. and returning at 2 p.m.
Explorer Package $45 per person - The Explorer Package allows you to buy tasting tickets as you go if you wish. There is more than just wine tasting to do at the wineries. Gardens, gift shops, art, music, restaurants and vineyards. All Inclusive Package $95 per person - This package includes tasting flights at 4 wineries. We will have your tasting tickets ready for you in advance at each stop. Avoid waiting in line and this package saves money. 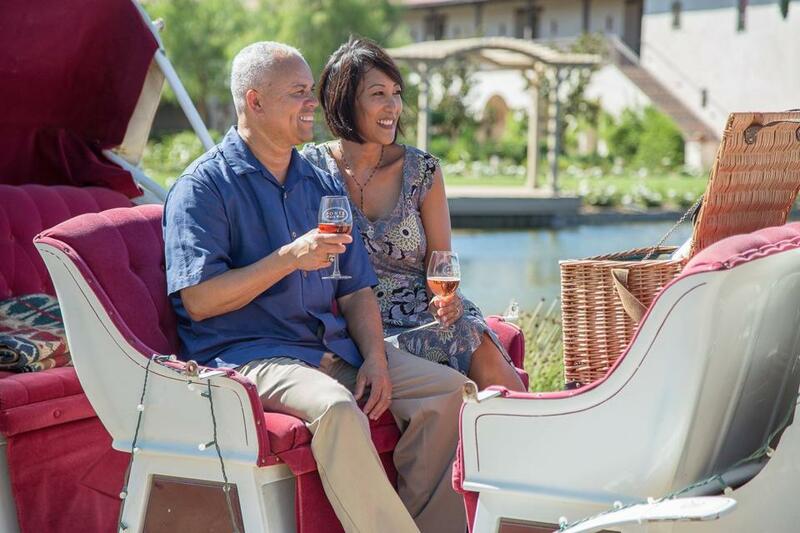 Relax and connect with that special someone as you leisurely travel our scenic route through the Temecula vineyards. Enjoy a picnic or a romantic evening under the stars. Private carriage rides go out 7 days a week as early as 8am and as late as 8pm. Proposal packages are available if you're ready to pop the question. 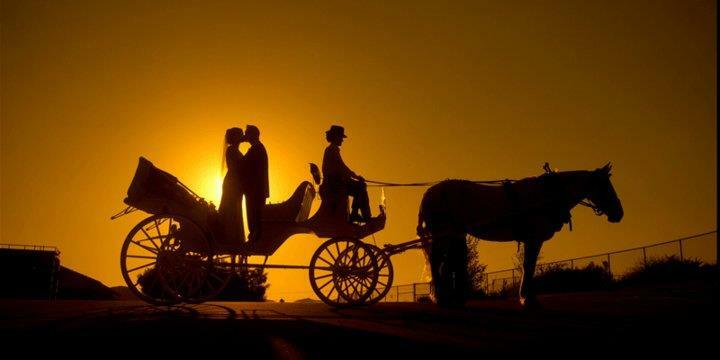 1 hour private carriage ride is $165 per couple and includes a bottle of wine. 2 hour private carriage ride is $270 per couple and includes a bottle of wine and a picnic of meats, cheeses, crackers, chocolates and olives. Reservations are required (844) 369-1852. 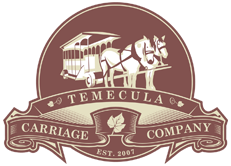 Our 2-hour private horse-drawn carriage ride is the perfect ride for a marriage proposal in Temecula Valley. 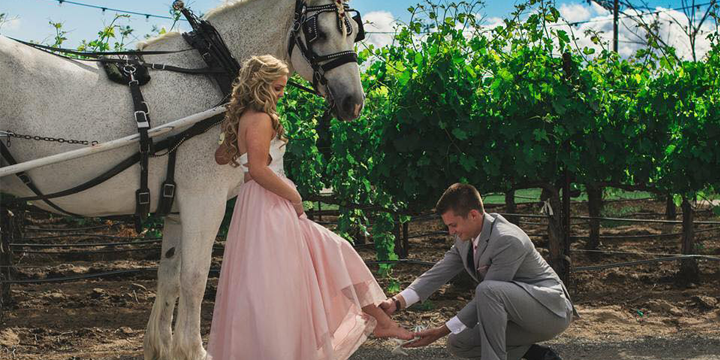 You and your loved one will travel through 100 acres of vineyards to a private overlook. This is a great spot to pop the question. Our assistant is available to snap some pictures with your camera of this memorable moment.